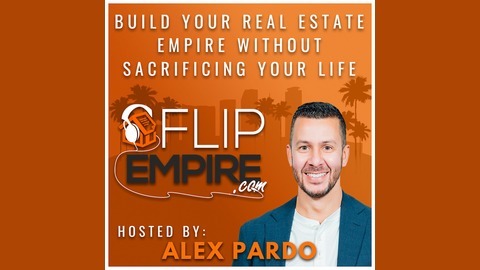 On The Flip Empire Show, Alex Pardo brings you strategies, interviews, and insights for smart real estate investors to help grow and scale your real estate investing business. 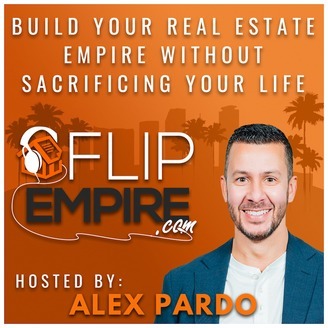 The Flip Empire Show was created for YOU, the smart real estate investor and entrepreneur. If you're looking for ACTIONABLE and SIMPLIFIED advice, Alex Pardo has you covered with his Master Class Expert Interviews, as well as the Q and A shows. Learn from real estate's heavy hitters, as Alex Pardo puts them on the hot seat to reveal their best strategies for running a profitable, scalable, and automated real estate business. Get a fresh perspective from a Real Estate Investor, Entrepreneur, and Coach that has flipped well over 300 homes. We're dedicated to adding value to you and your business, and bringing you the best content to help you make more money, build your empire, and experience freedom through real estate investing. For more strategies, and recommended resources, check us out at www.FlipEmpire.com. Disclaimer: The author, publishers, contributors and creators of this material are not responsible in any manner for any potential or actual loss resulting in the use of the information presented. The content of this publication is for informational purposes. No promise or guarantee of income or results is implied or suggested. Alex shares some growing pains he’s been experiencing in the business lately. He has on-boarded some new talent as well as shifted some of his team members around so that they’re in a more elevated and suited role for their talent and expertise. These adjustments take time, but it’s on you, as the leader, to make sure things are running the way they should be. Alex and his team have been experiencing some growing pains. The biggest asset the company has are the people and the company culture. Alex has been moving team members around so that they can maximize their core talents. Do you have the right person in the right seat and role? It’s human nature for us to take the foot off the gas after a really successful month. Have you enjoyed this podcast? Please share it! Click Here to apply for our next Holiday Mastermind in Punta Cana, Dominican Republic! Have a question you want featured on an upcoming Flip Empire Show? Head over to the Ask Alex page, and record your question. We’ve made it super easy for you, so let us know what challenges you are having, and Alex will answer it personally! Did you get your FREE Online Course? Text the word EMPIRE to 67076, and we’ll send you a link to get instant access to the “5 Ways To Scale Your Real Estate Wholesaling Business To Six Figures (In 6 Months Or Less)” video module training course. Subscribe To The Flip Empire Show, and Leave a Rating & Review! EP300: Inside Sneak Peek Into Our (LIVE) Daily Team Huddle!